10 Pack Morr 10% 60ml Hair fall Control regrowth treatment for Men. Morr 10% Solution has no effect in receding hairline and baldness at the front part of the scalp. Morr 10% Solution needs to be applied topically on the skin. It falls under a category of drugs known as vasodilators. Morr F 5% Solution-Hair Regrowth FDA Approved DHT Blocker. Morr-F containing the 2 active ingredients minoxidil and DHT Blocker used to halt hair loss and promote hair regrowth. It works by encouraging hair follicles that have stopped producing hair to begin making new hair and inhibit the natural hormone DHT from forming. This prevents hair loss and stimulates re-growth resulting in longer, thicker and increased numbers of hair. Finasteride is a 5-alpha-reductase inhibitor. Quantity: 1 of 60ml each. Prevents Hair Loss and Stimulates Re-growth resulting in Longer, Thicker and Increased numbers of hair. It works by encouraging hair follicles that have stopped producing hair to begin making new hair and inhibit the natural hormone DHT from forming. The Morr-f contains Minoxidil and 0.1% equivalent of 1mg FDA Approved DHT blocker in a topical solution form so you are spared from the side effects of taking that DHT Blocker orally while having its benefits directly on hair roots. Results may occur at 2 months. Not intended for frontal baldness or a receding hairline. Male pattern baldness is responsible for the vast majority of male hair loss. More than 95% of male hair loss is due to male-pattern baldness, a genetic trait. 3 x Morr 10% 60ml Hair fall Control regrowth treatment for Men. Morr F 10 % Minoxidil Lipid Solution. About Morr F 10% Solution. Side Effects of Morr F 10% Solution. Morr-F containing the 2 active ingredients minoxidil and DHT Blocker used to halt hair loss and promote hair regrowth. 5% Minoxidil Topical Solution. Size:6 Months. Descripntion see on the box in photo. Morr F 10 % Hair Regrowth DTH blocker FDA approved. Manufacturer: INTAS Pharmaceutical. Form: Solution. This prevents hair loss and stimulates re-growth resulting in longer, thicker and increased numbers of hair. Finasteride is a 5-alpha-reductase inhibitor. Also it will depend on the patients condition and their response to the therapy. Tugain Solution is used to stabilize hair loss and induce re-growth of new hair in areas where the hair is thinning. If one may experience more hair loss than usual than Tugain Solution is prescribed by the physicians. In such cases, we try our best to correct the problem promptly. Morr 12.5% Solution has no effect in receding hairline and baldness at the front part of the scalp. Morr 12.5% Solution needs to be applied topically on the skin. It falls under a category of drugs known as vasodilators. Morr F 10 % Hair Regrowth DTH blocker FDA approved. Manufacturer: INTAS Pharmaceutical. Exp 24 month from mfg date. 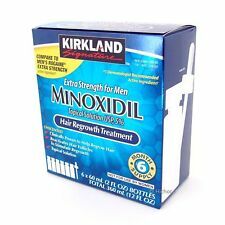 Kirkland Minoxidil 5% Extra Strength Men 6 Month Supply Hair Regrowth Solution . Condition is New. Shipped with USPS First Class Package. HOW TUGAIN SOLUTION WORKS. This prevents hair loss and stimulates re-growth resulting in longer, thicker and increased numbers of hair. Finasteride is a 5-alpha-reductase inhibitor. This is good through 06/2020 so these are very fresh. 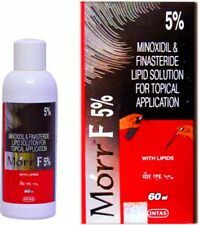 Morr F 5 % Minoxidil Lipid Solution. About Morr F 5% Solution. Side Effects of Morr F 5% Solution. Morr-F containing the 2 active ingredients minoxidil and DHT Blocker used to halt hair loss and promote hair regrowth. Fast and Reliable International Shipping!!! EXTRA STRENGTH Minoxidil 5%. Continued use is necessary to increase and keep your hair regrowth, or hair loss will begin again. by Kirkland Signature. Clinically proven to help regrow hair. Treat general thinning of hair on the top of the scalp. 5% Minoxidil Topical Solution. Results may occur at 2 months. (vertex only). Don’t wet your hair again for at least 4 hours after applying the minoxidil to ensure that the product is absorbed effectively. The item is new, sealed. Results may occur at 2 months. EXP : 02 / 2020. YOU GET 2 BOXES. EACH BOX HAS 6 × 60 ml ( 2 fl oz ) BOTTLES. TOTAL 720 ml ( 24 fl oz ). Expiration Date: 2020. Clinically Proven to Help Regrow Hair. Morr F 5% Solution-Hair Regrowth FDA Approved DHT Blocker. Side Effects of Morr F 5% Solution:Common Side Effects Of Minoxidil And Aminexil Include Burning Or Irritation Of The Eye, Itching, Redness Or Irritation At The Treated Area, As Well As Unwanted Hair Growth Elsewhere On The Body. For Hair Regrowth on Top of Scalp. Not intended for frontal baldness or receding hair line. 6 Pack Morr 12.5% 60ml Hair fall Control regrowth treatment for Men. (HOW MORR 12.5 SOLUTION WORKS. A) Spray B) Dropper. MINOXIDIL TOPICAL SOLUTION USP 10% MINTOP 10. This solution is trusted to stabilize hair loss and induces re-growth of new hair in areas where the hair is thinning. Minoxidil is mainly present in it that boosts up the growth of new hair and imparts shine and luster to the hair.